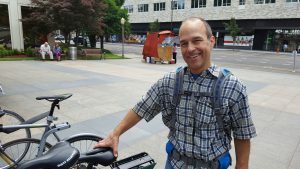 In summer 2016, Lloyd EcoDistrict, GenZe, and Go Lloyd launched an E-Fleet Pilot in the Lloyd District, offering 4 businesses access to e-bikes for a 3-week period. 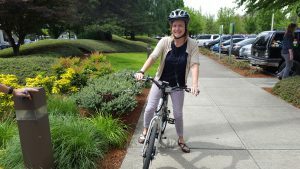 This program was created as a transportation solution in one of Portland’s most rapidly developing business and residential neighborhoods. Not only is the Lloyd E-fleet an investment in the health and happiness of employees, but will also contribute to the vitality of the Lloyd District as a whole by eliminating traffic congestion and greenhouse gas emissions. Following the pilot, we developed a collective buy-in program. Through this collective buy-in program for the Lloyd District, companies were offered the chance to purchase an e-fleet at discounted rates, at a variety of sizes suitable for businesses large to small. The e-fleet works as an integrated transportation resource for employees, ideal for all their workday commuting needs. The pilot generated excellent case study examples of what a permanent E-Fleet in the Lloyd would look like. The case study for the pilot can be found here.